Do you mean you didn't see this checkbox on the phone when you click screenshot icon on AirDroid Web? And is it happened recently or always asked for permission ? 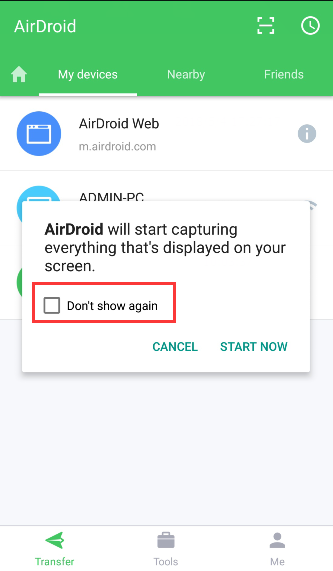 yes, on my new oppo f7 mobile its always asked permission for screen shot and i cant c checkbox " dont asked again "..
You can't Checkbox it because OPPO's system doesn't allow you to do this, you must get permission every time you use it. Oppo does this for user's security settings. For us mobiles are not allowed inside office due to restrictions.. so if these features are included I can access these from my desktop without missing anything.. and can be connected to friends each time. We're sorry that so far we will not add Whatsapp App and Facebook messenger to the desktop page. Airdroid is not working properly from Oppo F7, when I am connecting through my PC to Oppo F7, Within two minutes is dicconnected on both network data and wifi. You can use Huawei or Samsung， I'am not should whether vivo 9 have this facility.